Liam is 2!! I kind of can't believe he's 2, and at the same time, it feels right. He's our cute, spunky 2-year-old. I didn't plan a specific theme for his party. He had another dinosaur cake like last year, because he is obsessed with dinosaurs now. I had a Finding Dory photo booth set up that I got at Target for $6, but we didn't end up using it. I think the biggest difference this Birthday compared to last was how Liam could open his presents, and he knew they were his toys. it was pretty cute how he would let his cousins play with them for a bit and then take them back. He loves the excitement of being around his cousins and feeding off their energy. He loved his tool set, his stuffed animals and dinosaur he got for his birthday. Now, I need to write his thank you cards. I really enjoyed watching him go crazy over his presents and tearing them open. He got really good at opening them, and he was all primed for Christmas. Last year, he needed help opening them which makes complete sense when you're only turning 1! Liam is always up for cake. Ha He seems so grown up eating his own piece. If only I could get home to always eat his regular meals too. I love the "tongue" on the dinosaur is actually a 2 for his birthday. I remember Kittle laying her head on my stomach when I was pregnant with Liam. I always find it so cute when she does that. I wonder if she has any clue there is a baby in there. Opening a present with his new tool set he got from Uncle Phil and Katie. He loved having a new tool belt with some cool tools. Liam got a really short nap on his birthday so he wasn't feeling like himself for part of the day. He was starting to tired at dinner, and I brought out his cake to cheer him up. He was so thrilled to see his Thomas the Train cake. 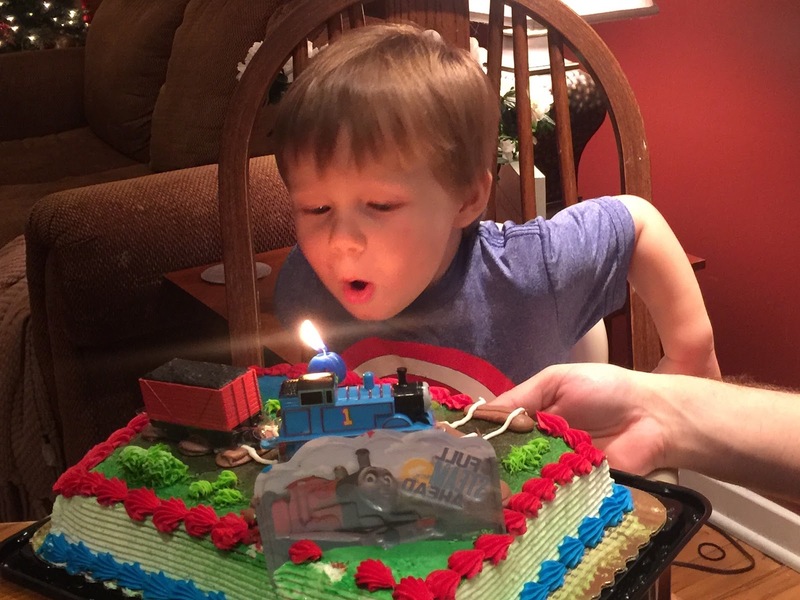 He lit up right away and acted incredibly sweet saying, "Cake, cake, cake!" Blowing out his candles on his 2nd birthday! I had a great time hanging out with everyone! We drove back that night after it had been snowing for a while. It's crazy how winter has arrived!